The term ‚lacing' is used in many pigeon standards. Anyone expecting a lacing as with laced chickens, will usually be disappointed. 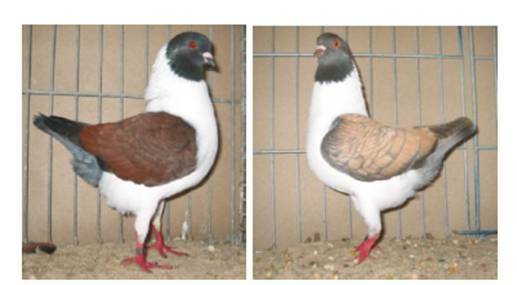 From a genetic point of view, we can distinguish three basic forms of which only the first shows a real lacing as shown in the introductory part of the book of Pigeon Standards description (Fig. 1). 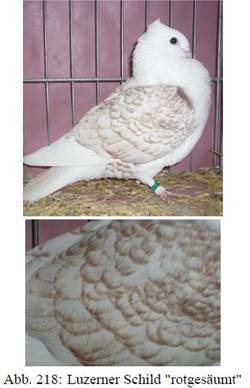 Oriental Blondinettes show a lacing similar to that of some colorations of chickens, e.g. silver laced Wyandottes. 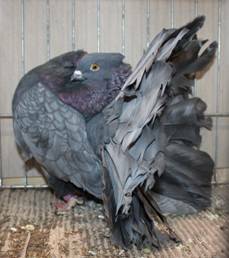 The genetic background is the Oriental Frill Stencil factor that probably is supported by additional traits responsible for the clear white centre of the feathers that is surrounded by a black border. The second basic form is related to checker traits, in which the black spots at the shield feathers are so extensive that only at the edge of the feather the color hidden under the checks remains recognizable. Overlapping of the springs creates the impression of a lacing. 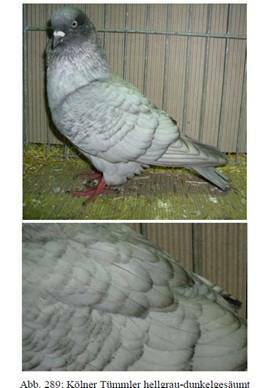 For blue-check pigeons, the brighter edge remains behind the check patches and creates the image of lacing (Fig. 2). Fig. 2: Checks at blue ground color. When Toy Stencil comes along, the black checks are turned into white patches except for a colored border. It creates the impression of a white spangling. From another perspective, it appears as a colored border around the white center of the feather (Fig. 3). In Modena Bronze, the black of the checks is replaced by bronze, not white like at Toy Stencil. The original color of the feather, not hidden by the checks, gives the impression of a blue-black border. In the case of fashion readers, it is "bronze-shield-laced" or, in the dilution form, “sulfur-shield-laced” (Fig. 3). Another example is Gold Gimpel with a gold-sulfur lacing. As may be seen at the separated shield feathers at the right in Fig. 5 the impression oft he lacing my be basically traced back to the checker trait and the blue-blackish frame. The third basic form is determined by the Spread factor. Ash Red bars and checks with Spread are from their phenotype Spread Ash in different shades. Many of them have more or less reddish intersperes, often concentrated at the border. From some distance you get the image of a lacing surrounding the feather. The same is true for Spread Reduced after some selection. Those are standardized as ‚Light Grey-Dark Laced‘. Also the so called lacing at some Andalusian and some others is nothing more than an optical illusion and not a real existing colored frame. The different kinds of lacing discussed here are a challenge for judges not aware of the different genetic background and the kind of lacing that is possible at all, but also for the fanciers to handle the different kinds in the breeding pen.